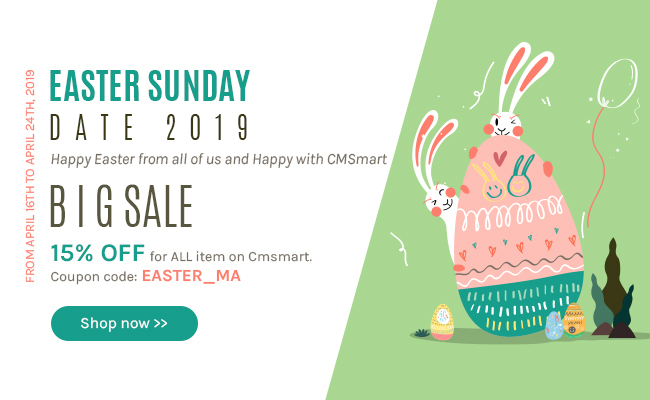 What do we have in Magento 2 blog extension on Cmsmart? About two recent years, if we mention to marketing aspect, online blogging appears as one of the best effective marketing tactics. It satisfies your customers because it makes them feel that they are listened to, their needs are responded to. From the point of view of readers, the blog will form a real “live” environment for people to communicate. To help you build professional blog right on your site, Cmsmart released product call Magento 2 Blog extension that is predicted to be one of the top hot and perfect Magento 2 extensions on the market. Customizing the main column of the blog page: We provide 3 types of blog page including Blog page with a column, two columns and three columns. Creating unlimited Blog Post: Magento 2 blog extension allows users to create, delete and edit post category as well as select several posts for appropriate post categories right in the back-end. Managing comments: You can manage all comments of your customers right on the back-end. With each comment, you can delete or change status such as enable, disable or pending. Sharing your post on social networks: In this digital era, social networks are the indispensable part of each website, they will be the channel to spread interesting content. Magento 2 blog extension will allow you to add sharing buttons on each page for Facebook, Twiter, etc. Ultimate Responsive layout design: This extension will work well on any screen sizes of smart devices such as a smartphone, tablet, desktop, laptop, etc. Multistore Support: It supports multiple stores for Category, Post, Comment, multiple languages and multiple websites. Navigating content through tags: You can choose to display post tags easily and through those tags, your audiences can find the posts they want in the fastest way. Moreover, you can also configure a number of tags right in the back-end. Navigating content through Category: On the Blog Page, to show all posts of the category just by clicking that category. Post Search: Through post search on the blog page, your audiences can find what they are looking for easily and quickly. Showing Recent Blog Post: In the back-end, it is so easy for you to configure o display Recent Blog Post in the sidebar of the blog page. Related Blog Post: this feature added to enable you to create relinks to another post, which will influence positively to views and sale on your site. Blog Post Information: Magento 2 Blog extension allows users to show full information about each post such as Author or Created date, this feature will actually make sense in building blog post reliability. Displaying related products: With each blog page, the administrator can choose to display other posts related to that one. Easy to install and use: With just several simple steps, this extension is ready to work on your site. Compatible with any themes: You can integrate it easily with any Magento 2 themes to make your site become more attractive and professional. Magento 2 blog extension offers you a noteworthy opportunity to communicate and interact with your regular customers and casual visitors. You will have an interactive two-way communication platform to provide all information such as promotion, upcoming products and gets feedback from customers.